As the coin presses in Denver shut down production of the one cent coin in 1914, no one regarded the 1914-D as a rarity. Consequently, most of the 1.2 million mintage entered circulation, where they acquired heavy wear or became lost forever. However, by 1936 the scarcity of the 1914-D Lincoln Cent was widely recognized. One numismatic circular, Raymond's Standard Catalogue of United States Coins and Currency, listed the value of the 1914-D at $2.50, the highest of any Lincoln Cent. When the popularity of Lincoln Cent collecting soared in the 1950's and 60's, the 1914-D became one of the most sought after coin in numismatics. Prices rose accordingly. With fame and popularity came problems. Alteration fraudsters and counterfeiters took advantage of inexperienced collectors in their zeal to add a 1914-D to their coin albums, unloading thousands of fakes on the market. Some scholars believe there may have been more phony 1914-D Lincolns in existence than authentic examples. Over the decades, this has not dampened enthusiasm for the 1914-D. Price increases have been consistent over the years. No surprise, since this is a key date in one of the most widely collected series in US numismatics -- Lincoln Cents. Older collectors who were active in the coin hobby back in the 1950's and 60's most likely remember the popularity of the 1914-D Lincoln Cent. The lofty status of the 1914-D earned it a spot in our Rare Coin Values Index, which takes the composite percent change over time of a pre-selected group of 87 rare US coins, the purpose of which is to understand the strength and direction of the overall rare US coin market. 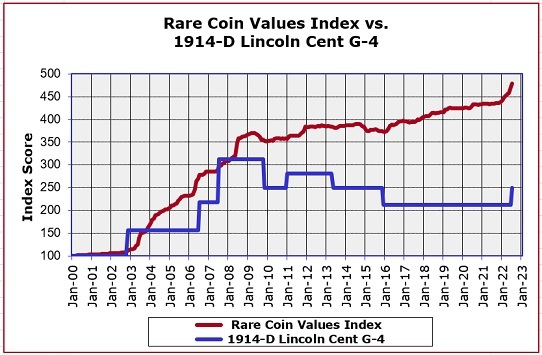 The blue line above represents the percent change since the year 2000 in retail value of the 1914-D Lincoln Cent in G-4 condtion, starting at a baseline index of 100. The red line, starting from the same baseline, measures the performance of the Rare Coin Values Index. To the surprise of some, the 1914-D rates a bit below average when compared to the Index as a whole. However, no collector can go wrong by purchasing a properly graded, problem-free 1914-D Lincoln Cent. The Index is updated monthly.